Roll through the historic streets of Kansas City on this iconic double-Decker bus. Choose from a variety of departure times and locations to begin your 90-minute tour of the famous and fascinating Kansas City. 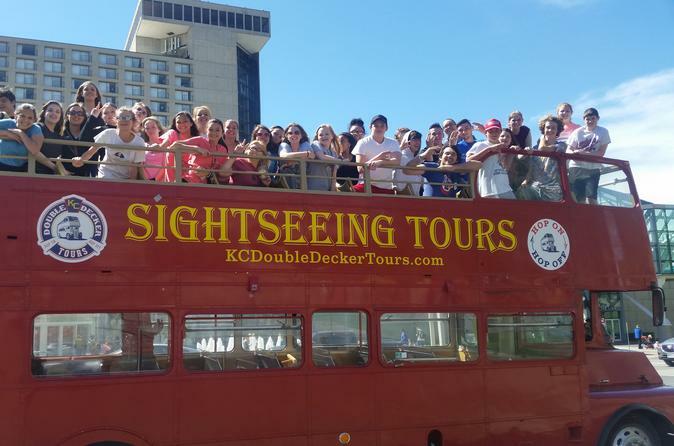 The narrated tour will take you on a joyride by Kansas City's most popular, remarkable, and nationally recognized attractions along with a jaunt through Kansas City's most notable shopping districts and neighborhoods. Begin your tour of Kansas City from one of multiple locations and departure times. Take in the most incredible and stunning views of Kansas City atop an open-air double-Decker bus. This tour offers you ease and convenience by letting you choose from a variety of departure times so that your tour of Kansas City fits with your schedule. Pick your preferred departure time, board the bus, take a load off, and get your camera ready as your local tour guide narrates your 90-minute city tour of iconic Kansas City. Your guided city tour gives every guest the opportunity to see nationally acclaimed attractions including: The National World War I Museum & Memorial, The Nelson-Atkins Museum of Art, Boulevard Brewing Company, and Historic Union Station. Guided city tours also roll through historic and nationally recognized shopping districts, entertainment districts, and neighborhoods including: The Country Club Plaza, Crown Center, Kansas City Power and Light District, Downtown Kansas City, Historic River Market, The Garment District, Quality Hill, Historic Crossroads District, Southwest Boulevard, Historic Westport, and Midtown Kansas City.